I don't dig Wes Anderson's vibe most of the time. I find his work smarmy (ingratiating and wheedling in a way that is perceived as insincere or excessive) like he either can't take himself or his ideas seriously without degrading them or he is completely insincere about those ideas in the first place and is mocking more forthright individuals. I understand his films hold a special place in the hearts of so many film lovers but he usually leaves me cold. Isle of Dogs found its way into my heart despite not being an Anderson fan or being particularly fond of dogs. It's not to say that Anderson's trademark style isn't there. Isle of Dogs is filled with enough irreverence and smugness to make his fans smile. But his "boy and his dog" tale rang far more heartfelt than his live action work. There are elements of political commentary mixed in but Isle of Dogs is essentially a celebration of the love between man's best friend and what must therefore be dog's best friend and it was fairly beautiful. Anderson's visuals in this stop motion epic are outstanding, taking his strong work in The Fantastic Mr. Fox to a new level. From the character design to the art direction (always a strength in his films), Anderson has made a beautiful film to watch. The trailers truly don't do the film justice in just how gorgeous it is. As with most Anderson films the plot errs on the side of ridiculous and again I recognize this is the selling feature for his audience which often wants to push back against believability in cinema for their own reasons. That's not the point of his work, to tell us something that doesn't coincidentally all work out. 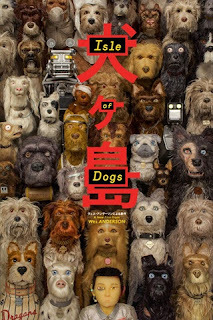 So while Isle of Dogs remains as irreverently Anderson as his fans will demand, perhaps it is sweet and lovely enough for those of us who tend to bristle at his work. He won me over.